Rev. 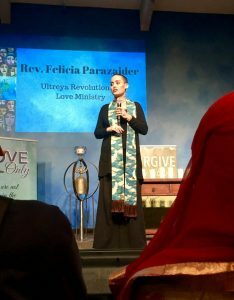 Felicia Helen Parazaider attended the Chaplaincy Institute for Arts and Interfaith Ministry, and was ordained in March 2012. She holds degrees from University of California Berkeley in both Religious Studies and Peace & Conflict Studies, and has completed training programs in Spiritual Psychology and Tree of Life Teachings. She is a certified Reiki Level l II practitioner and Pace e Bene (Pace e Bene nonviolent service) Nonviolent Trainer. Rev. Felicia has ministered extensively to drug addicts and alcoholics, both on the streets of Los Angeles and in the Bay Area. For several years she served as a Hospitals & Institutions (H&I) chairperson, in charge of taking panels of recovering alcoholics into USC County Hospital to carry the message of recovery. She also worked at Kaiser Hospital Oakland and Walnut Creek as a chaplain during her Clinical Pastoral Education (CPE) training. Her more academic work has led her to teaching classes in nonviolence and meditation at UC Berkeley. She is a self-described radical sacred activist, traveling to India and the Middle East on peace delegations, walking over 200 miles through the Nevada desert against nuclear proliferation and for peace, as well as being arrested several times for participating in nonviolent civil resistance against drone warfare, and the zero tolerance policy separating migrant families from their children. She is the founder of The Revolution Of Love (ROL), a ministry which focuses on inner work and outer work in the world through the teachings of nonviolence. The ministry met over 150 times in the San Francisco Bay Area for service from 2012-2017. Upon moving back to her hometown of Los Angeles, she relaunched ROL and this new emerging congregation meets on alternating weekends for “Saturday Night Live” services in the North Hollywood area. She is the creator of The Prayer Rope and The Love Challenge, both branches of ROL that are specific ways to begin to transform oneself and this world. Along with her passion for ROL, she sits on the boards of the Interfaith Solidarity Network (ISN) and the Southern California Committee for a Parliament of a World Religions (SCCPWR). Her latest focus is speaking on nonviolence as a powerful force for change at this historic moment. In 2019, her first book will be released on her story from violence to wholeness. Rev. Felicia’s life is a dedication to love and justice.